"We are the reflection between Dundee and Mexico City"
What could a Scottish city with barely 150,000 inhabitants possibly have in common with a megalopolis of more than 20 million? UK/MX Digital Futures participant Miriam Mabel Martínez gives a personal view. It’s not every day that one gets to converse with an UNESCO City of Design such as Dundee, nor to interweave the creative ecosystems of two apparently unconnected places. What could a Scottish city with barely 150,000 inhabitants possibly have to do with a megalopolis of more than 20 million? We begin to discover in a video-table conference in Spanish and English. The discussion about this trade of ideas was energising those present to now begin another project: the growth of a rhizome sprouting organically from the Binnacle of Makers (Bitácora de Hacedores de la Cuidad de México), a network to help the citizen-users of Mexico City how to better use resources and spaces to Make. But this goal invites those both here [in Mexico City] and those there on the other side of the Atlantic to experience daily life from a different perspective. More than a cultural test per se, we are the reflection between Dundee and Mexico City. The experiment has just begun. Along Paseo de la Reforma two giants chat: a skyscraper and a monument. They are as different in form as what they contain inside: the skyscraper guards banking secrets and the monument, named Estela de Luz (Stele of Light), holds curiosity — in the heart of it lies the Centro de Cultura Digital . The hustle and bustle outside doesn’t even compare with what lies inside. It is 4 pm on a Friday, and down below the first guests arrive. Makers, gamers, tipsters, artists, musicians, scriptwriters, and architects… Laura, Dulce, Erik, and Andrés are there as well to take part in this 48 hour marathon. The attendees slowly begin to make themselves comfortable. Some drink coffee and others tea. Some begin to spread themselves out along the tables: they take out their laptops, remove their shoes, chat, and settle in. It is like looking for a partner to dance with. The orchestra — the hosts that is — are tuning their instruments, and the guests are adjusting their suits and ties. Everyone looks around at each other: anyone could be the perfect partner. Who will they dance with? Not all are “strangers.” Many are already regulars of these creative get-togethers. This is reflected in the familiarity with which some greet each other. No one is too intimated; the novices quickly learn the code, and the dance continues with the promise that the best prototypes will be exhibited in September at the Victoria & Albert Museum’s Design Week in London Town. Grace Quintanilla, director of the Centro de Cultura Digital, wanders about spying with her iPhone on the participants and guests, like the British musician Trevor Wishart, who pokes around near his display titled “The Resonance of Things.” Grace doesn’t stop; she is as eager as the participants, many of whom are first-timers in these undertakings. They don’t know what to expect, but they wait hopefully. And they are not mistaken. Jacinto Quesnel is in charge of the proceedings. She first presents Jon Rogers, professor of creative technology, who along with Irini Papadimitriou, Digital Programmes Manager of Victoria & Albert Museum, is the reason behind this meeting. They are the guests of honour at this technological celebration. But they are not the only British present; in Dundee other maker colleagues are also inventing new ways to live the city in a marathon dialogue. The rules are established and with the premise of finding partners, the activist-makers develop the functional prototype that corresponds to one of the four guiding principles of work (civic consciousness, or commitment, collaboration, and innovation), and launch themselves towards the dance floor where around them advisors circle. I leave Laura, Andrés, Erik, and Dulce at the CCD. It excites me to think that they have found others who will invite them to dance for the first time in a marathon of this sort. I know that guided by advisors like Héctor Rivero, El Mitotero, they will join this clan of makers that have decided to use technology to tell stories and later to share these stories to help others understand technology. Each one, amateurs and those more experienced, will find a path to narrate whether through a new app, an object, a game, or sound—and what’s more, a story that will have an application in the community and foster the gathering of discoveries just as the Astro Vandalist, Interspecifics, MusicMakers Hacklab, and the Chipotle Collective will do in the Laboratorio Arte Alameda Evening of Chiptunes, a poetic-sound-visual jam — interdisciplinary ventures that play with other tools and instruments in order to make music. Dulce is right — the goal of this marathon is “the enjoyment of helping and growing.” Mission accomplished: the Digital Futures are narrating. Translated by Anya Russian, abridged by the CE team. You can read part one of this blog here. Miriam Mabel Martínez is an editor and chronicler. She is currently working on what she describes as "a collective book about fabrics seen as a nodal form of art for social resistance". This piece will be published in full in 'Crafting Our Digital Futures', a publication funded by the Arts and Humanities Research Council as part of Digital Design Weekend 2015. "Welcome to the vanguardism of the periphery"
A walk through Mexico City’s past, present and future spotlights how the megacity is pioneering bringing technology, creativity and innovation into civic life. Miriam Mabel Martínez is our guide. Mexico City's Laboratorio Arte Alameda is a major hub for art and technology. We chatted with Tania Aedo, a visual artist and key figure at the Laboratorio, about their work. 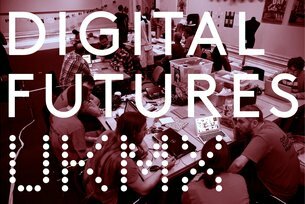 Digital Futures UKMX kicks off this Friday, connecting Mexico City and Dundee and finding creative tech solutions for problems common to both. We find out more about the inspiration behind this ambitious trans-Atlantic lab.